Competitive imbalance in high-school sports isn’t just a private-school issue, but those private schools have a clear advantage in the athletic realm. EVERETT — The agreement was to stay off social media. But when Jimmy Fallon’s cracking jokes about your school? “I saw the tweets going around,” Archbishop Thomas Murphy football coach Jerry Jensen said. Fallon’s jab last week during a monologue for “The Tonight Show” provided a laugh for what has been, according to Jensen, the most trying year of ATM’s 16-year football history. ATM caught Fallon’s attention because of so-called NFL-sized players matched up against typical high-school teams, winning the first three games by a combined score of 170-0. Fallon’s punchline was revealing Tom Brady, photoshopped with a mustache, as the Wildcats’ quarterback. Boys basketball: King’s School (1A), Northwest Christian (2B). Girls basketball: Lynden Christian (1A). Boys cross-country: Northwest Christian (1B/2B). Girls cross-country: Northwest School (1A). Football: Gonzaga Prep (4A), Eastside Catholic (3A). Boys golf: Bellarmine Prep (4A), King’s School (1A). Girls golf: Bellarmine Prep (4A), King’s School (1A), Northwest Christian-Colbert (1B/2B). Boys soccer: Archbishop Murphy (2A), Seattle Academy (1A), Saint George’s (1B/2B). Girls soccer: Seattle Prep (3A), Seattle Christian (1A). Boys Tennis: Charles Wright Academy (1B/2B). Girls track & field: Mount Vernon Christian (1B), Saint George’s (2B). Volleyball: Kennedy Catholic (3A), Lynden Christian (1A). “Sorry guys, but I had to go back to my regular team,” Fallon read as a quote from Brady. In reality, ATM made national headlines because five of its six Cascade Conference opponents forfeited their games against the private school this season. Parents cited safety concerns in lining up against ATM, which includes six players weighing 250 pounds or more. 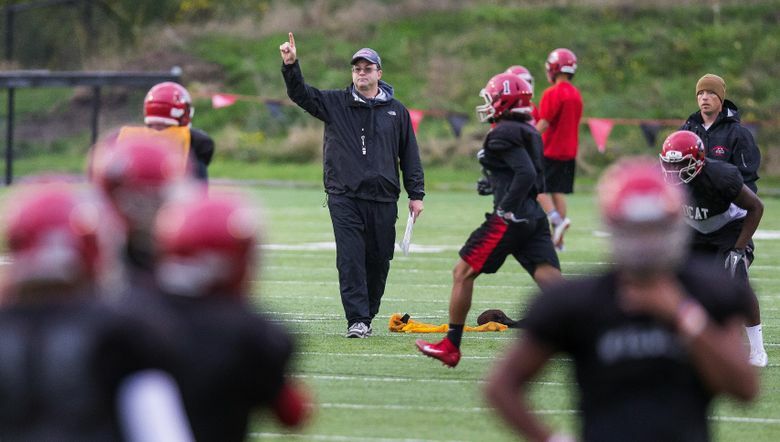 Archbishop Murphy’s last game was a 38-0 win against King’s School on Sept. 16. They will play Olympic from East Bremerton at home on Saturday, ending a string of four straight forfeit wins. The five weeks since has sparked a national debate about the advantages of private schools versus public schools and whether it’s time for Washington to address competitive imbalance as other states have done in recent years. Minutes from Interstate-5, ATM’s red-bricked campus is nestled among trees off a busy street. It has a quaint feel, but its dominance in sports is apparent. Among its approximately 500 students, 300 play sports. And they’re some of the region’s best because, under Washington Interscholastic Activities Association rule, private schools can draw students from a 50-mile radius. But Wildcats senior Abe Lucas, a 6-foot-8, 260-pound lineman who is a Washington State commit, pointed out he was on an ATM team that went 3-6 in 2013. They lost 63-14 to King’s and 22-21 to South Whidbey, which forfeited to ATM this year. In the Cascade Conference, there are three private institutions. King’s played its game against Archbishop Murphy. But Cedar Park Christian forfeited last week’s matchup, which was homecoming for ATM. Oregon: Surveying member schools to determine if current structure of six classifications for all sports for four-year cycles needs revising. Oregon High School Association creates leagues for its schools. Ohio: Will implement, beginning with the 2017-18 school year, a multiplier formula based on where an athlete lives and the number of years in the same education system to determine school enrollment. Figures will only be used for football, basketball, volleyball, baseball, soccer, and softball. Indiana: All-in postseason for every sport where classifications are dictated by individual team success on a two-year cycle, not school enrollment. Alabama: In 1999, became the first state to adopt a multiplier for all private-school enrollments after finding majority of the students also participated in the sports programs. New York: Has multiple athletic associations with varying rules, including determining divisions based on past success. “It’s a multilayered, difficult issue and we’ve been sucked up into a whirlwind,” Cascade Park Christian athletic director Todd Lundberg said. 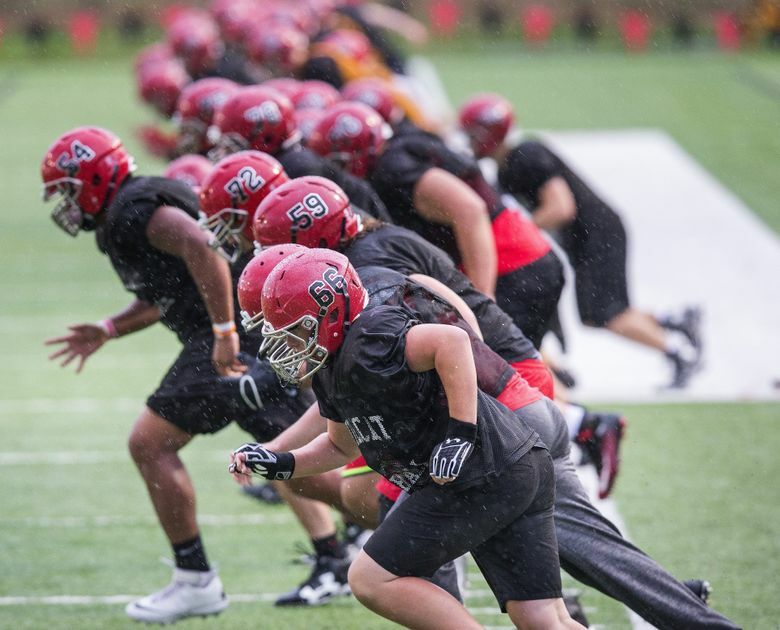 Lundberg said honoring the school’s commitment to play and tempering parental fears regarding injuries was a struggle before ultimately deciding to forfeit. Despite safety concerns, there are indications football is safer than before. The seven total deaths directly attributable to football nationwide in 2015 were 0.64 cases per 100,000 participants in a sport where 1.1 million play on the high-school level, according to the National Center for Catastrophic Sports Injury, which is based in North Carolina. A recent study in Indiana supported football is better at mitigating injury after implementing mandatory safety training for coaches, which the WIAA also requires. The WIAA also limited the amount of full contact that can occur during practices. But football isn’t the only sport where private schools have a transparent advantage. These types of schools are more plentiful in the smaller classifications and just as dominant. In fact, 52 of the state’s 62 private schools are spread across Class 1A, 2B, and 1B. Their enrollments range from 461 to 26 students. From its location in Puyallup, Cascade Christian can attract students from Tacoma to Seattle. The Cougars have competed for Class 1A state football championships five times and won in 2010 and 2014. King’s, which is 12 miles outside Seattle, has won 40 Class 1A team state championships in the past 20 years. Certainly, there are exceptions to this trend. Colton, a public high school 20 minutes from Washington State University’s campus, has won the past seven Class 1B girls basketball state titles. On average, it costs $10,000 per year to attend a private school in Washington, according to Private School Review. Many students receive some form of financial aid, regardless of household income. And like colleges, a good athletic department attracts students. Families who have the means and desire to pay for private schools are also likely to financially support their student athlete with private lessons, performance coaches, traveling club teams and booster contributions for quality coaches. Yet, public-school parents in the same affluent areas do the same. They’ve created dominant programs in swimming (Mercer Island), gymnastics (Woodinville), soccer (Issaquah) and tennis (Newport) in Class 4A. One state, Indiana, has already tackled the problem in a way that continually seeks to even the playing field. Indiana, comprised of 321 schools in football, went to a format in which playoff divisions are decided by a point system configured every two years for every sport in 2012. Under such a setup in Washington, a Class 4A volleyball power like Bellarmine Prep could at some point face Colfax, which dominates volleyball in Class 2B. Theoretically, the same would follow for ATM. It could line up against Skyline, a Sammamish public-school football program established in 1997 that’s won seven Class 4A state titles and graduated 23 Division I players the past five years alone. IHSAA also accounts for the cyclical nature of sports, changing a school’s classification if no longer successful. Each sport also isn’t restricted to the same number of classifications. Indiana divides soccer in half but has six classifications for football. One school could have 10 sports in five different classification levels. IHSAA’s postseason system also seemingly would quell Archbishop Murphy’s current problem — finding regular-season opponents. Unlike states like Oregon, the WIAA generally stays out of the formation of leagues and schedules, focusing on rules and state tournaments. It does weigh in when schools appeal decisions to the WIAA executive board. Jensen said he was told the executive board will approve ATM to play an independent schedule next season and remain playoff eligible since the Cascade Conference will no longer play his team. But Jensen, also a first-year athletic director, said it can’t be a long-term resolution. For the 2018 football season, Jensen expects the WIAA to step in. There were two proposals from January that could be revisited. ATM is located in the thick of the WesCo Conference’s 2A/3A schools, but was rejected entry as its first private school due to competition concerns. A Northwest Conference 2A football-only proposal was nixed in a 5-3 vote by school principals for the same reasons. Granite Falls, one dissenter, felt it couldn’t compete against potential opponents Lynden and Sedro-Woolley in addition to Archbishop Murphy. Once talks dissolved, Lakewood left the Cascade Conference for the Northwest Conference to boost its competition level.